There are many purposes for gates and many ways to construct them. We at Arbor Fence enjoy taking pride in building everything from your basic security panel/chainlink gate to an elaborate, beautiful custom creation that makes your entrance a personal statement. Whether it is for residential, commercial or agricultural applications, your gate doesn’t only have to be functional – it can be decorative too! We invite you to call us today to develop and construct your idea of the perfect gate. The width of these gates are much smaller than driveway gates. Specifically designed to be an easy access point and usually just matches the fenceline. We take pride in building you an entry gate you'll love. Whether its for security or decoration, built out wood or steel, we can fabricate it. **Note: we do everything EXCEPT for the automatic gate OPENER - all automatic gate operators will need to be installed by others. Security panel and chainlink gates are utility gates used on commercial, residential and agricultural sites. On occasion, however we have had some very creative clients who have used these gate styles to create an artistic result. 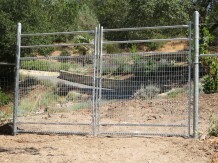 Both security panel and chainlink gates can be built to fit any height requirement. They can also be installed on wood or steel posts. 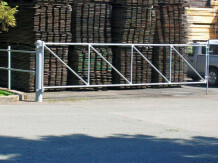 Barrier gates are used to restrict vehicle access to areas such as parking lots, commercial properties, access roads, bike or walking paths, logging roads and other thru-ways. This type of gate can be made of any material but usually has a simple design. Common materials are galvanized pipe or square steel tubing (either plain or powder-coated for color).